Wow! A great week of submissions and with that challenging colour combo too! 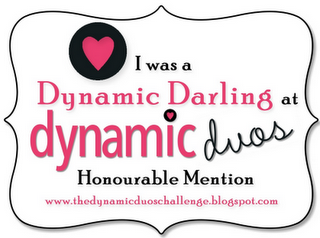 It's Lesley and I have the honor of selecting our Diva Dynamo this week. Thank you once again to our inaugural design team here at Dynamic Duos for their commitment over the last 6 months. I cannot believe how quickly the time went by! Later today, I will be announcing our next team of designers, who are excited to reveal their first set of creations for tomorrow's challenge! Sandy's card stood out for me this week! The two-toned roses, done in the yellows were so pretty and the fussy cutting she did, blew me away! 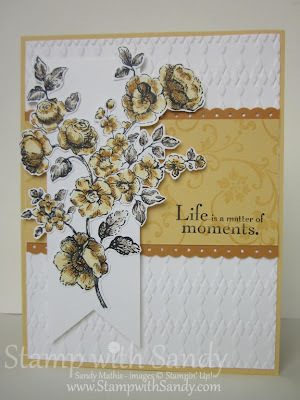 The soft and subtle background embossing, and the clever stamping on the yellow center panel all added to make this card a special creation indeed! 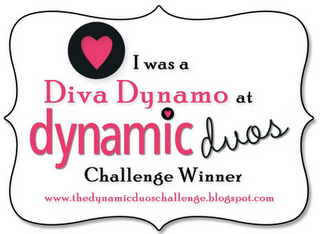 Congratulations Sandy on being our Diva Dynamo this week! Be sure to join us tomorrow for a new challenge with our "Bold and Sassy" color challenge, which we hope you will enjoy! Congratulation Sandy and to all the Dynamic Darlings. Thank yo Paula for chosing my card. Challenging colours but all of the entries were fabulous! Woo hoo, I'm a Diva! Thanks for selecting my card, Lesley, and thanks to the entire team for your lovely creations each week. Beautiful card, Sandy! Congratulations! And congrats to all the darlings...thanks Aimee, for choosing mine!!! Wow, thanks Allisa!!! Congrats to all the winners! All the cards are fabulous!! !